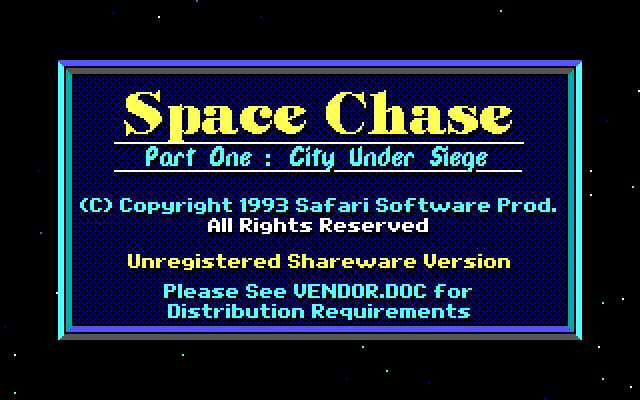 Today we’re looking at Space Chase, a little known platform game made in 1993 by Safari Software, one of the first games that they released. It features Jason Storm, a former Marine that takes on dangerous missions. 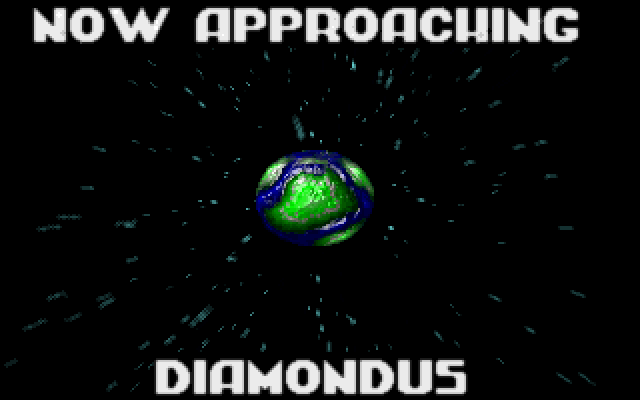 You’re given a mission to stop the organisation known as Evil Guys inc. from taking over the planetary government. 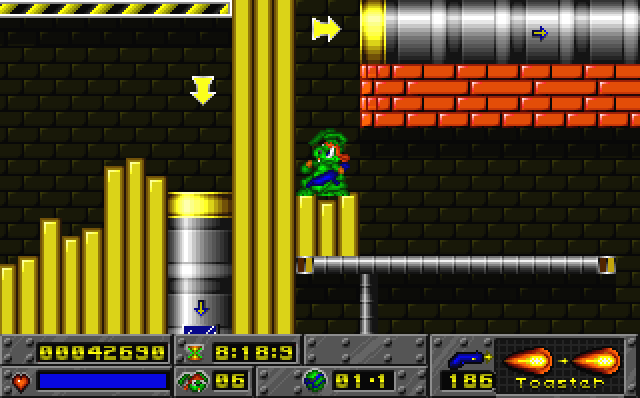 It is an platform game much like older games such as Duke Nukem and Dark Ages. 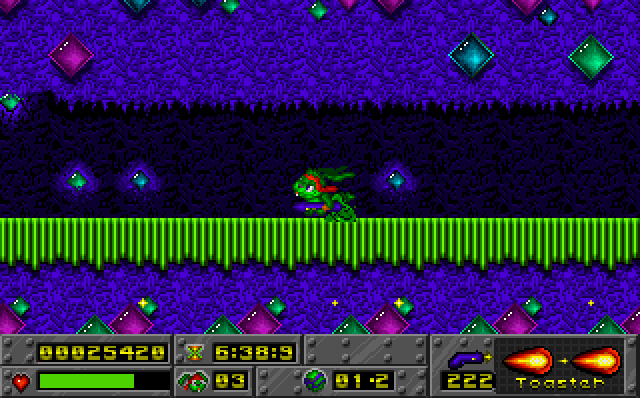 The game uses EGA graphics, which is quite unusual for a game released in 1993. I believe this is because they were supporting old 286 machines, which whilst obsolete, were still common. The game performs well enough that it would probably be playable on a faster 286 machine, but would struggle on the slower machines running at less than 16Mhz. The sprites and backgrounds are quite detailed compared to say Duke Nukem, but in some ways less appealing. I still quite like the artwork, although many others don’t seem to. Animations look decent and smooth with plenty of frames for each animated sprite. The only annoyance is with the scrolling, it’s smooth enough, but the distance from the screen edge is shorter moving to the right than it is when moving left. This makes moving right a bit more difficult as you don’t see hazards until you’re nearly on top of it. Sound effects come from the PC speaker, and are pretty much what you’d expect. Music support is included for Ad lib and compatible cards. The music isn’t quite what you’d expect to find in a platform game, it’s quite relaxed and suites the different pace. I quite liked the music and the mood it set. If you read the marketing material for the game you’d be expecting a fast-paced action game, perhaps something like Duke Nukem. 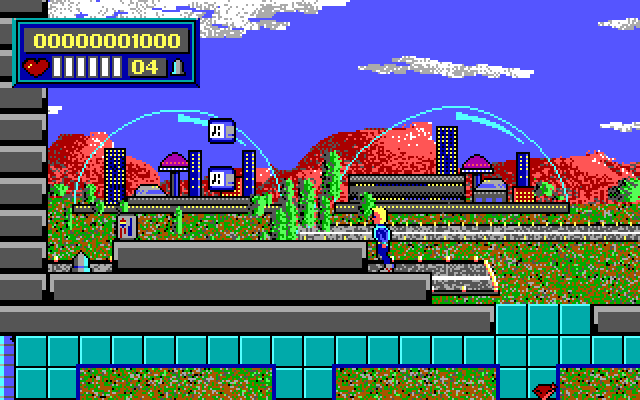 But Space Chase isn’t as fast paced, although there are action elements and some aspects are clearly inspired by games like Duke Nukem, such as the health pickup which suspiciously looks like a futuristic soft drink can. The controls are fairly tight, but the jump mechanic is more like what you might find on a console game. 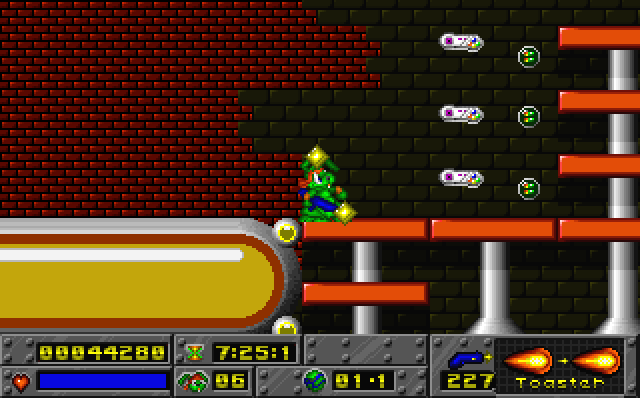 For most DOS platform games your jump height is identical no-matter how long or short you hold the jump key. Space Chase on the other hand replicates what usually happens on consoles, the duration of the button press controls the height of the jump. It’s not a bad mechanic, it’s actually quite useful, but as I am more used to DOS games it took a little time to adjust. As I said before the game play is more relaxed than other more action focused platform games. There are some puzzle elements, such as finding a security node for activating a lift, but it’s not really a puzzle game either. 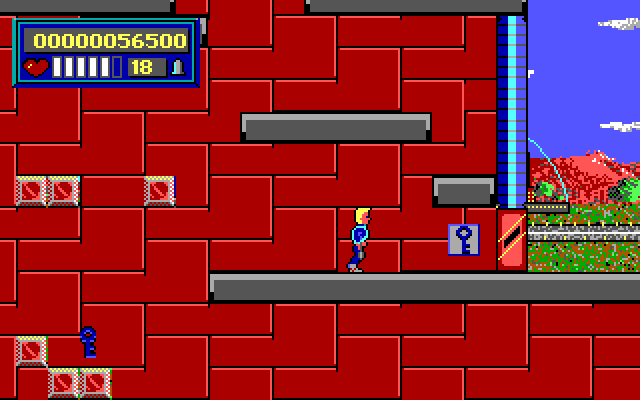 You could think of it as Duke Nukem with simple puzzles added and the action toned down. There is a limited amount of ammunition for your gun, so you often have to use it sparingly, or simply take a hit from an enemy rather than use a bullet. Avoidance is often the best tactic, and some areas filled with enemies can be skipped altogether. If you run out of bullets you can literally get stuck in some sections as shooting a security node can be necessary for progress. The level design is pretty decent, exploring them to find score items, ammunition or health is generally a pleasant experience. The only hassle is a few jumps that are difficult because of the low ceiling height. There are areas that are dead ends that you wouldn’t normally need to explore, but they usually contain something as a reward. The difficulty settings change the enemies that appear, with easy have far fewer enemies than normal or hard. Whilst Space Chase has some minor issues, it is quite a fun platform game to play. It’s relaxed without lacking action, but also not focused on shooting down all the enemies. I played about three quarters of the shareware version and quite enjoyed it. Unfortunately there is no legit way to get the registered version, but the shareware version is available on the Classic Dos Games website. 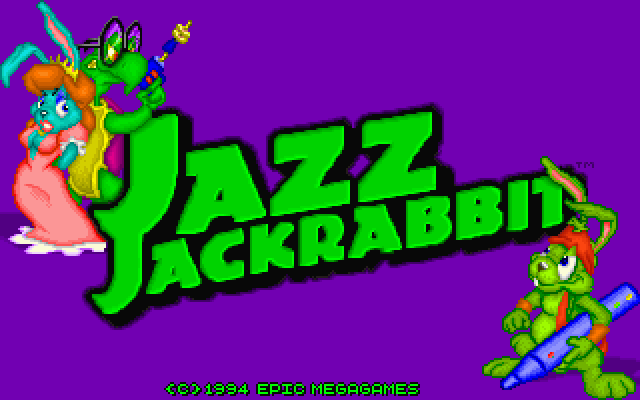 Todays game, Jazz Jackrabbit was made by Epic Megagames back in 1994. It is an action platformer with a quirky story based on the old fable of the Tortoise and the Hare. Your character, Jazz Jackrabbit, has to save the princess Eva Earlong from the bad guy, Devan Shell. Today is my first time playing Jazz, as my DOS machine back in the day was simply not powerful enough, that and I was never exposed to it. It can be exceptionally hard finding a registered copy of this game, so today I’m playing the shareware version. The first thing I noticed was how amazingly good the artwork for this game is. The graphics are like they came straight out of a comic book. Animations are similarily also very good. In-game sprites are large and detailed with plenty of frames of animation to go wih them. 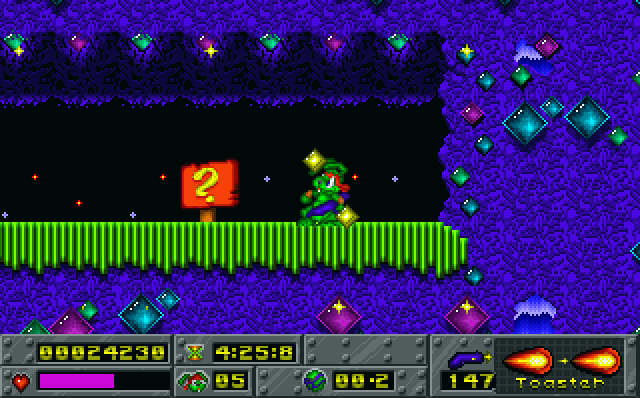 The game supports exclusively VGA graphics, which by 1994 was the norm. However I played under Dosbox and found that it would have required quite a beefy machine for the time in order to play. The minimum specifications in the documentation say about a 386@ 33Mhz, but when I set up the equivalent in Dosbox I found frequent slowdowns. You probably really need a 486 @ 33Mhz but ideally 50Mhz. In 1994 machines like this were around, but still expensive, and many wouldn’t upgrade for a while. Jazz also suffers from an unfortunate bug if you run it on a machine that is too fast. Basically upon starting the game you will get a Runtime Error 200 when using a fast CPU (>~200Mhz). This comes from a bug in the CRT unit found in Borland Pascal. Basically when calibrating a timing loop a counter overflows and causes problems. Fortunately Dosbox makes it easy to avoid, and there is a patch online, search for borland CRT patch. 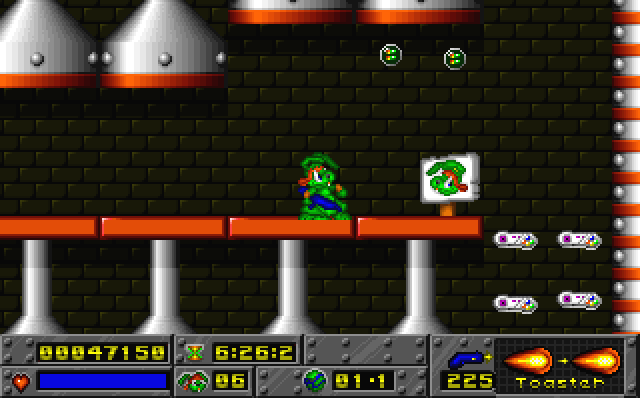 Jazz supports Sound Blaster cards mostly for sound, but there is also support for the GUS, Pro Audio Spectrum and Sound Blaster clone boards. The music sounds like MOD music and is exceptionally good. Digitised sound effects are used and are also quite effective. Jazz has a distinctive voice and will even ask the player what they are doing if he is idle for a short while. I think the sound design works quite well, the music and sound effects fit the art style well, they’d work well in a saturday morning cartoon. Gamplay wise Jazz borrows elements from many platformers, but the most obvious is that he is fast like Sonic. However Jazz defends himself mostly with his big gun, the LFG-9000. His speed can be problematic, as I found I kept running into enemies before I had time to react. This is partly because the sprites are large you can’t see all that far ahead. I found this less of a problem once I started to learn the levels a bit and had some more practise with the controls. The levels are split into pairs for each planet that you visit. The planets each have a different theme, the first level seems to be simpler, and the second is the more complicated and difficult of each pair. The themes for the planets are quite different from each other, each with their own enemies and artwork. Although I did think the first two planets reminded me of the early levels of Sonic the Hedgehog, this is mostly in appearance and some features like the tubes in level 3 and 4. Of course since I only played the shareware episode I can’t comment on the other episodes, so they may be different as far as level design goes. Interestingly my 4 year old daughter also had a go at playing, she seemed to like the colourful graphics and the cute little “bunny”. Unfortunately the game was a little bit too hard for her, mostly as she hasn’t learned how to use more than one control at a time. I tried a few different difficulty levels and didn’t notice much change. It seems the lower difficulty levels just give you more hit points, which did mean I lasted longer before dying, but some difficult parts still killed me. I have mixed impressions of Jazz Jackrabbit, at first I found some elements of the game difficult to deal with, such as Jazz’s imense speed and jumping controls. However as I played the game more it grew on me, I was usually able to avoid running into enemies mainly because I knew where they were. I still find some aspects of jumping a bit annoying, but it’s certainly quite fun anyway. The Guardian at the end of the first episode was a little bit of a let-down, it was too easy to beat, otherwise there is plenty of challenge. 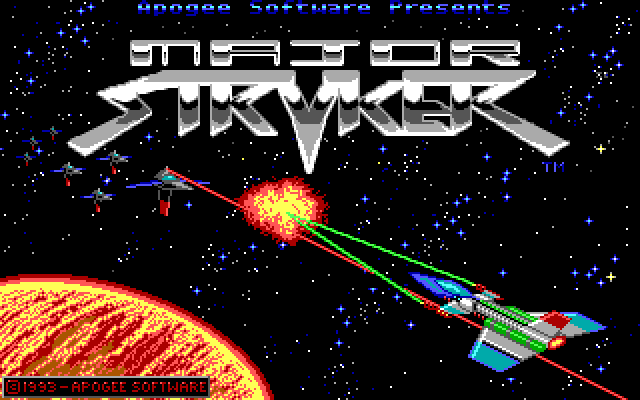 Major Stryker was released by Apogee back in 1993 and is one of the very few shoot-em-ups released by them. Like many other Apogee games it uses EGA graphics and was one of the last to do so. The story of the game is like many other shooters, after a large world conflict the Earth was left with little ability to defend itself. Along come the Kretons from a nearby worm hole bent on taking over the world. You, Major Stryker, a hero of the previous war are called in to defend the Earth and take the battle to the Kretons. The EGA graphics are quite good and impressively scrolls quite nicely with 3 different layers. 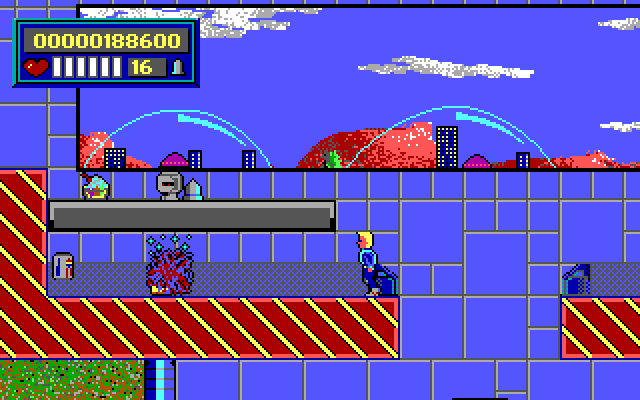 The foreground where all the action is, the middle which just has scenery and some enemies approaching, and the backgrounds which is static. EGA cards typically were not as capable as the later VGA cards so it’s quite an achievement to get that many layers going at once. I’m also very impressed with the quality of the artwork, although in my opinion Overkill is drawn better, a game which was often compared to Major Stryker unfavourably. Something that does annoy me about the graphics is how busy they can get in some levels. Each planet you have to assault has 3 different areas with 3 bosses at the end of each. Some of the areas have a background similar not only to the enemies but also some projectiles making it difficult to see many of them in the middle of the action. It also doesn’t help that many enemies and projectiles move down the screen nearly the same speed as the background moves reducing the appearance of movemt and decreasing their visibility! Sound in game is quite good although some of the sound effects are a bit strange, as if someone had made the sound with their mouth! Given they also support Adlib and PC speaker for the sound effects this is forgivable as it is difficult to achieve consistency between the devices. The music however is very good, mostly because it was written by Bobby Prince, a legend in music for DOS games. It fits the different aspects of the game very well and there is a good variety never making you hear a song until you’re sick of it. I found Major Stryker was pretty fun to play, but is very very difficult. The difficulty curve turned out a little strange, some of the earlier levels turned out to be harder for me than some later on. I think thats because of the graphics for those particular stages. I found the best way to succeed was to concentrate more on dodging enemy fire than on shooting down badies. Until you have the power ups for your ships guns it can be very difficult to shoot something without having to dodge the numerous bullets flying around. At fixed time intervals a pod comes around with a weapon upgrade in it requiring you to shoot it open and pick up the contents. The weapon upgrades basically add more projectiles for press of the fire key, eventually upgrading to a spread shot that shoots in many directions. The fully upgraded weapon is quite deadly and will quickly carve its way through the coming enemies. However it doesn’t make you invinsible and the minute you are hit you lose all your upgrades, which can make the game suddenly much more difficult. If you are hit with no weapon upgrades you lose a life. One of the more annoying enemies for me was the ship that brings in the shield upgrades. It seems to come at fixed points in the levels and shoots many projectiles that can be very hard to dogde. It combined with the normal enemies is usually very dangerous. Whilst I had fun with Major Stryker I’m not really quite sure what to think of it yet. I enjoyed the game play for the most part, but found some aspects of the game frustrating. I thought losing all your upgrades when hit was too punishing, and often resulted in making a difficult section even harder than it needed to be. On the other hand once you get a good run going it’s quite fun and a challenge to shoot the enemies, rescue humans and dodge enemy fire. I guess given that it’s now freeware you should give it a go if you like shooters, but it won’t be to everyones taste. Blake Stone: Aliens of Gold was released by Apogee late 1993 just before the release of Doom. It was created by a small studio that was basically three guys. They modified the wolfenstein 3d engine to make an entirely new game. It had an unfortunate release time as Doom quickly eclipsed it, and it suffered from less success because of this. Of course this isn’t a surprise as Doom is a huge leap ahead in many ways over the Wolf3d engine games. I remember Blake Stone primarily because the shareware version was installed on my highschools computers back when I was in my early teens. When we finished our computer studies work, we were often allowed to play games as a reward for finishing early. I was naturally quite good at computer studies classes mainly because I had been programming since I was young, so I got quite some extra time playing and I helped a few other students as well. Hey this alien isn’t gold! 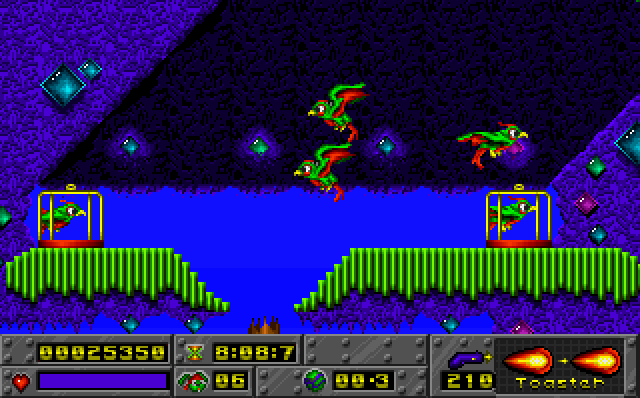 The graphics for Blake Stone are VGA only as was the norm for most games of the time. The quality of the 3d graphics is pretty much the same as Wolfenstien 3d. They were improved in subtle ways, such as floor and ceiling textures, but you don’t notice that so much. The main difference however is in the art style. The game is significantly more colourful than its predecessor, and I believe many sprites have more frames of animation. It feels less spartan, and more like an active world that you’re exploring, well compared to Wolf3d anyway. The sound engine is again pretty much untouched from Wolfenstien 3d. Many sound effects come from the FM synthesis on your Sound Blaster or Adlib card. They sound quite good for what they are, but only one can play at a time. This can make hearing audio clues difficult in heavy action. Digitised sound is also available, but pretty much is only for the voices of the enemies, and perhaps some of the guns. Music in game is your standard Adlib type, and is quite good. I believe it was written by Bobby Prince who was well known for writing good Adlib music. Gameplay is where the biggest differences in the game lie. The game is certainly much more difficult on the normal setting when compared to other games of the same vintage. There are more cases where an enemy kills you from a hiding point just after you enter a room. They are capable of following you around even through doors, but don’t always seem to do so. Interestingly some people in the world wearing lab coats will also help you, so sometimes it pays to ask questions before shooting. They give you food tokens, ammo, and sometimes some information, but beware not all the technicians are friendly. They just might try to shoot you in the face! The game is basically divided into buildings which are basically episodes in the fight against Dr Goldfire. The goal of each level is to locate the security pass to be able to go to the next level in the building. The elevator in the level serves as both the entrance and exit to the levels, it seems you can also revisit a level, although I don’t know if your progress in that level is saved. Your default weapon is an autocharge pistol that requires no ammo, is silent, but also recharges quite slowly. I’ve found it is good for dispatching the weaker enemies without alerting everyone in the near area. The other guns are pretty much sci-fi versions of the original Wolf3d guns. Some enemies require you to have the sub-machine gun style weapon or better in order to destroy them, the most common one being the ceiling mounted gun turrets. You’ll want to use the sub-machinegun as it is economical on ammo and is good against all but the toughest enemies. Of course there is so much ammo around you could probably get away with using the bigger faster firing weapons. Whilst I found the game was more difficult, I still found it wasn’t frustrating. Usually I am killed by carelessly walking into a room and getting shot by someone who was hiding just out of sight. The main and pretty much only gripe I have is with the limited number of lives. This is pretty much an artefact of older games, and wasn’t really done away with completely until much later. Otherwise this game is a hidden gem of the DOS PC game era, if it had come out six months before Doom it probably would have enjoyed some of the success it deserved. Crystal Caves is a simple puzzle platform game released by Apogee back in 1991. It was made at a time when many games by Apogee had EGA graphics whilst many others had moved onto the popular VGA cards. Back then people didn’t upgrade their machines as often, so there were still many older 286 and older machines running EGA cards. The graphics in Crystal Caves are in EGA, and aren’t the prettiest around. The sprites are animated quite nicely, but require a 286 at least for the game to work smoothly. This would have made it difficult for anyone using an older 8088/8086 based machine to play the game smoothly. Given that many 286 machines could support VGA graphics via an upgrade, they could have used VGA without limiting themselves to people with the latest hardware. The sound comes in the form of PC speaker, it sounds ok but is a bit reminiscent of game and watch style sound. The game doesn’t support any sound card unfortunately, as support for an ad lib based sound card would make it sound much better. Like many Apogee games of the time the game excels in game play rather than technical prowess. You play the part of Mylo Steamwitz who is gathering crystals to save up money to buy the Twibble farm that he has been dreaming of owning. The game has some nice original elements including the ability to play the levels (known as caves in game) in any order you like and a hub level from which you choose which level to play. Each level has a number of hazards to avoid that come in many forms. There are enemies that roam the levels, spikes stationary guns that shoot at you. You have a gun that you can use to shoot some of the monsters, but others you need to simply avoid. Care must be taken when shooting to make sure you don’t hit the air supply in a level, otherwise you die rather explosively. 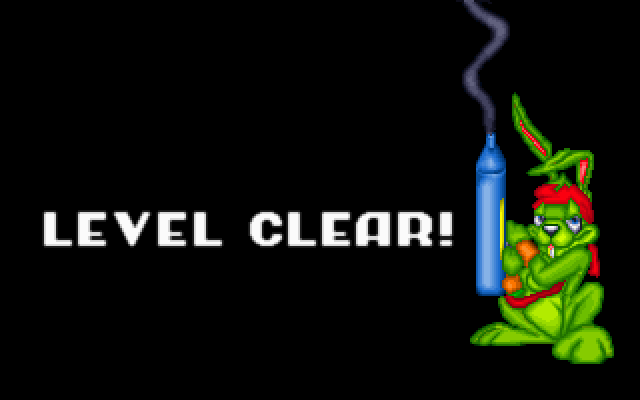 To exit a level you must first collect all the gems, and then make it too the exit airlock. This frequently requires you to use switches to open doors or activate elevators. It certainly isn’t an action packed platformer like Duke Nukem which was released around the same time. But it certainly has some moments when you need to think about what you’re going to do next, and there is some challenging platform jumping to be had. There are 16 levels per episode and they vary in difficulty, some are very hard whilst others are easier, but not easy to complete. The game play makes up for the graphics and sound not using better hardware, and I had fun playing. I can see why some people consider it to be one of the classic Apogee platform games. Taking Care of Business (or TCB for short) is a single screen puzzle platform game made by Moonlite software back in 1994. Moonlite software made many platform games in the DOS era, most notably the Clyde’s Revenge games and my favourite Hocus Pocus. TCB is unlike the others in many ways, but has a similar art style to Clyde’s Revenge. TCB is very much like the Block man game by Soleau Software in that you solve puzzles by moving tiles around in a simple platform environment. TCB is some-what more complex as there are many more tools, tiles and hazards to account for when trying to solve a puzzle. You are able to destroy bricks with your head or dynamite, create ladders, flip switches, and push some tiles. You will have to avoid lightning traps and blocks that disappear after you walk on them in one direction. TCB is very unusual for a DOS game in that it is one of the few that uses high resolution VESA mode graphics. The graphics as I said have a very similar style to the Clyde games. The main character Demolisher Dirk looks very much like a muscular construction worker version of Clyde with a hard hat. Because the developers had used this style before the graphics appear quite polished despite being fairly simple. The graphics animate very smoothly even on a slow machine, so if you happened to put a VESA compatible card in a 386 (what a waste) it would work quite well. I love the animation of Dirk head butting a wall to destroy it! Sound is available in the form of either PC Speaker or Sound Blaster sound. The digitised sound on the sound blaster is quite good, but not essential to your play experience. I didn’t try the PC speaker sound, if it were to be annoying it is a simple matter to just turn the sound off. The puzzles are quite challenging, but the game is quite forgiving. There are no limits on the number of attempts of a puzzle and you can attempt the puzzles in any order you like. The game has a nice demo mode which shows all the game elements and how they work and it can show you a solution to a puzzle if you get stuck. The controls behave the way you expect, and are easy to use. The game has some nice online help so if you have trouble you won’t be lost for long. I found the game quite fun, and I didn’t mind having to replay some puzzles to eventually solve them. There are 60 puzzles to solve so it will keep you busy for quite some time. There were some additional ones available but I’m not sure where you’d get them now. However the time you will spend will be limited as you will eventually solve all the levels, or get sick of trying on the harder ones. If you’re like me you’ll eventually forget how to solve the puzzles and be able to come back to play them again. Taking Care of Business is charming and worth a download especially if you like the puzzle platformer genre. It reflects the quality of the other Moonlite software games which I’d also recommend.